I pulled the sheepghan out of the closet again and slogged through the charting issues (by ignoring my previously worked-out chart and just putting the colors in the places I wanted them). My reward? Wow. That’s actually looking pretty great. And sure, great is subjective, but it’s looking a lot like I meant it to, which is great to me. However, as you may or may not be able to tell from the darkish photo, I’m going to have a gazillion ends to weave in. Way, way more than the cotton top. Way, way, way more. I think the next church-baby afghan will be markedly simpler. Oh, by the way – I figured out why Knit Picks sent me those color cards….they introduced new colors in both of those yarns and were trying to get rid of the old ones! The sneaks. However, I’m not complaining, because the new colors are all heathers and I love a good heather. It’s actually my favorite sort of coloring. I love them. Seriously, if I name my first-born daughter Heather it won’t be because of the flower. (I kid. Maybe if I ever get a cat it’ll be a Heather.) Um. Where was I? My point is, I like heathered yarns. One of These Skeins is Not Like the Others.. Your blanket is beautiful – I can’t wait to see the finished product. That is a really cool afghan!! And, I feel your pain on the tying ends in. I did a cute baby blanket, once that looked a lot like a carpet when I was done. The pattern was REALLY fun and fast, but the weaving in made it a REALLY long and boring process. I later learned how I should have hidden it better…dangit! I think if you became more comfortable with knitting like you are with crochet, yeah, well the world might explode. Your crochet designs blow me out of the water!! I love that sheepghan! Very cute! 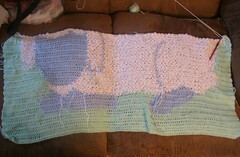 That afghan is looking so awesome. Hey you can name your kids Heather and noone with ever know why you did except you and us. Ha ha.